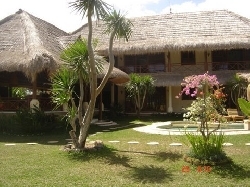 Welcome to our selection of holiday homes to rent in Indonesia. Indonesia is a country in South East Asia. It appears as a dense archipelago covering 735,000 square miles just north of Australia. It consists of around 18,000 separate islands, with around 8,000 named and just 922 permanently inhabited. With a population of 238 million people it is the fourth most populous country on Earth. Indonesia a former Dutch colony has been an independent republic since after World War II. There are at least four major religions practiced including Christianity, Islam, Hunduism and Buddhism. Islam is practiced by 86% of the population. In total an incredible 742 different languages and dialects are spoken. The Javanese population are by the far the greatest and most widespread. 58% of the Indonesian population live on the island of Java alone, which also makes Java the world's most densely populated island at 2,000 heads per square mile. At the other end of the scale the Chinese population may be very small at just 3% of the population. The weather in Indonesia would be described as tropical. The dry season runs from April to October and this is considered the most suitable time for British tourists. Being an archipelago, just about anywhere in Indonesia is either on or near a beach. Naturally surfing, scuba diving and sailing would feature among the most popular activities. Eating in Indonesia may seem strange and confusing at first. Rice, noodles and chilis feature very heavily while fish and chicken seem overall more popular than red meat. Eating with bare hands is more common than in the UK, but to do so with the left hand is unacceptable. Because of the high Islam presence, halal food is more common than non-halal. British tourists are advised to drink only water from sealed bottles. 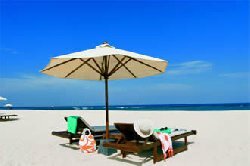 Looking for self catering holiday accommodation in Indonesia? then below is a selection of villas in Indonesia and apartments in Indonesia that can be rented direct from their owners. You can either click on each listing for further details or you can use our search engine on the left if you are looking for something in particular.